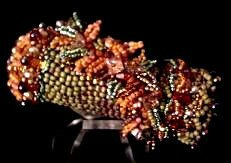 A beaded mini Kaleidoscope that will captivate students' imagination. This class is for those with a good grasp of Peyote stitch. Students will work with the N'debele or 2 drop peyote stitch. They will learn several vine, leaf and flower embellishments. 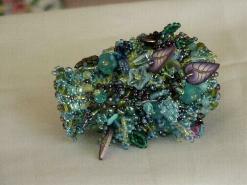 The class will stress using your own creativity and trusting your artistic bead vision. Each Kaleidoscope will be as different as each artist. This includes designing the inside of the kaleidoscope! A work of art truly made by the eye of the beholder. To see other class descriptions follow link below.